Have you been so busy that you just collapsed on top of your work desk because your body simply cannot take it anymore? Have you been so exhausted that the moment you lie down on your bed you slept through the day and you slept through the night and you slept through all the noise and mayhem around you for more than a day? As humans we should ideally have 7-9 hours of sleep everyday. We need to sleep, because we’re humans. Animals need to sleep too. Even machines and robots need to rest and go for maintenance, or risk a system failure or an engine overheating. Even if you’re facing a deadline and don’t have the time to eat or sleep, after a while you’ll probably find yourself micro-sleeping without you knowing it. Even if your child is running a high fever and is at high risk, you’ll probably need to sleep a bit here and there. Even if there’s an enemy troop just outside your city laying siege, you’ll probably need to let your guardsmen take turns to sleep. But not God. He is omnipotent – and that means he has no weaknesses, and he alone is in no need of sleep. If humans can be insomniac, then God is forever asomniac. In this study, we will take a brief look at what it means when God doesn’t need to sleep, and how we will often struggle with that fact in our lifetimes. 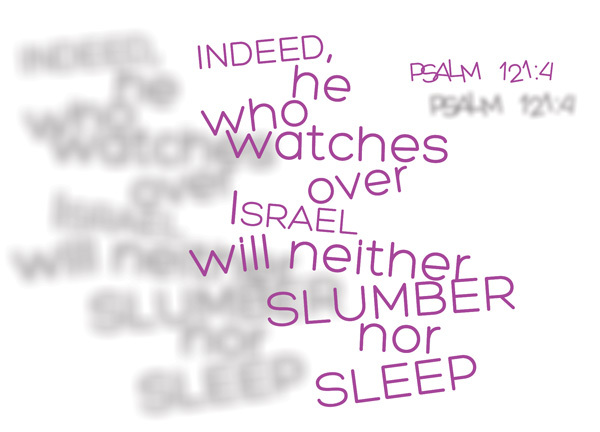 indeed – The idea of God never sleeping is first brought across in the previous verse – He will not let your foot slip— he who watches over you will not slumber [Psalm 121:3] – an emphasis then, in verse 4, is made on the fact that God neither slumbers nor sleep. neither slumber nor sleep – You know the old gags about how an employee naps at his desk for a minute and his boss walks over with a stern face demanding for the notes to an important meeting? Well, you’ll never catch God napping at a crunch time of your life; you’ll never catch God in slumber when you need him. Well, you’ll never catch God sleeping at all – because he never sleeps, even if you sleep, or even if you turn away from him. He is always prepared to help you, always there for you. You can always count on him. It is an eternal promise – God never slept, isn’t sleeping, and will never ever sleep. Can you imagine if humans do not need to sleep? Basically, the ideal amount of time to spend sleeping is one-third of our day. So if you don’t need to sleep, you’ll essentially gain a lot more time to do a lot more things. But well, maybe this idea of having more time will never apply to God, who runs on a different time-scale then we do, the time-scale of eternity. Was it just last week that Pope Benedict officially retired from papacy? I’m neither a Roman Catholic, nor do I pay special attention to news from the Vatican, so correct me if I’m wrong. I am not here to touch on the differences between the sectors of Christianity, but rather, the common points, which are aplenty. What intrigued me was this one line that he said during his final address: “…there were moments, as there were throughout the history of the Church, when the seas were rough and the wind blew against us and it seemed that the Lord was sleeping.” There were moments that the Lord seemed sleeping. I have no doubt that he knows Psalm 121:3-4; I have no doubt that a man of such stature would ever seriously think that God is sleeping. But well as we know that God never sleeps, it doesn’t mean that we won’t ever feel as if God is sleeping. In fact, we may often feel that way. When wave after wave of difficulties and challenges are thrown into our paths; when we are cornered at all sides by circumstances people or duty; when we pray day and night devotedly but God doesn’t seem to listen, much less to answer them. We know for a fact that God doesn’t slumber. He doesn’t need to sleep, he is always watching us, he is always on call. But that doesn’t mean God is never silent. And history of mankind has shown us that when God chooses to remain silent, it is a tragic and frightening situation, because it usually means his wrath is coming. It heartens me greatly that, while sometimes God may seem to be sleeping – he never is, and we are assured of it in Psalm 121:3-4. Because we know for sure that God knows and sees what has happened, we can continue to fight this good war and put our hope in his eventual deliverance. It may take a long time – hopefully not hundreds of years, like it was for the Israelites. It may mean changes and decisions that are hard to make, like it was for Pope Benedict, being the first to retire in 600 years of papacy. It may take so long that you will begin to feel as if God is sleeping. But keep fighting on and keep believing, because we’ve already been promised way before we were born that He never slumbers. He never sleeps. He is watching over us, even if it doesn’t feel like it. Let us cling on tightly to God’s precepts, and remember that no matter how everything seems to point to God being asleep, he isn’t sleeping. Even if you are sleeping; even if you’ve turned away from him. He never sleeps.